Substantial bungalow residence on elevated site with picturesque views. Situated midway between Monivea and Abbeyknockmoy. 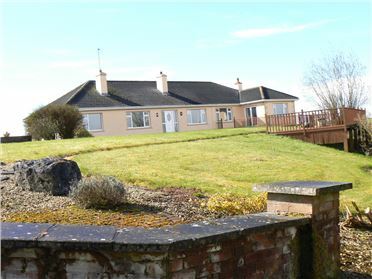 LOCATION: The property is situated in the townland of Currafaireen located approximately 2.5 miles from the villages of Monivea and Abbeyknockmoy and approximately 17 miles from Galway City in a scenic country location on an elevated position with panoramic views. Easy access to M17/M18 Tuam to Galway/Limerick Motorway interchange at nearby Annagh Hill just outside Abbeyknockmoy. The property is positioned on an elevated site on the Monivea to Abbeyknockmoy road. The property avails of all local residential amenities in the small country villages of Monivea and Abbeyknockmoy with its local schools, shops, church, community facilities and local playing fields. The area is an attractive residential location within an easy commute to Galway City and nearby towns of Athenry and Tuam. Excellent opportunity to acquire a unique residential holding in a wonderful setting comprising two semi-detached former linen houses in need of completion together with limestone outbuildings and walled paddocks and gardens. Part of the former Jameson Estate  Nestling on c. 10 acres of walled paddocks  LOCATION: The property is located in a picturesque country setting situated just a few minutes drive below Skehana Village and past Screenes Pub of Gilkagh on the left hand side in off the main road. The property enjoys an idyllic rural setting in a peaceful country location and with good access in off the main road together with a secondary side road access. 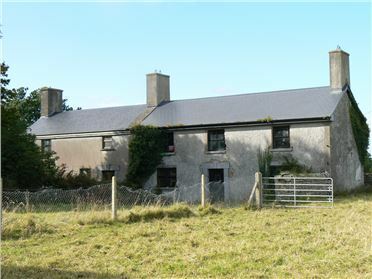 The property is located approximately 5 miles from Monivea, 5 miles Abbeyknockmoy and within easy access of the nearby local towns of Moylough and Mountbellew. The soon to be opened M17 Galway-Tuam Motorway with access at the Annagh Hill junction just outside Abbeyknockmoy offers excellent accessibility to the wider catchment area. Characteristic Town Centre single storey house in need of Renovation. Zoned Town Centre / Commercial. 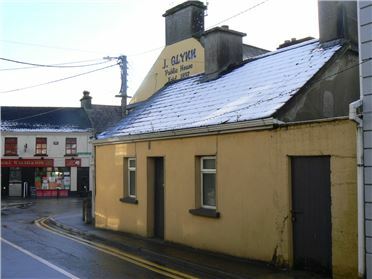 LOCATION: The property occupies a high profile prominent location close to the intersection of Church Street with Old Church Street in the centre of Athenry Town and on a very busy street leading to the Church, Railway Station and many well established local businesses. The immediate surrounding area is largely town centre and mixed in character with both commercial and residential uses. The property occupies a prominent corner location with good prominent position in the heart of the Town. DESCRIPTION: The property comprises a small compact single storey house in need of refurbishment. The property extends to 295 sq.ft and comes with a small side yard with door on to Church Street. The property offers excellent potential for retail / office / alternative uses subject to Planning Permission, however the property is currently Zoned C1 Town Centre / Commercial offering potential for such uses. Excellent opportunity to acquire a superbly located town centre property in the heart of the popular medieval and heritage market Town of Athenry with all residential and commercial amenities at its doorstep. 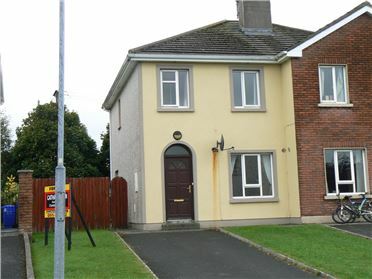 OR SALE BY PRIVATE TREATY ATTRACTIVE 3 BEDROOM SEMI DETACHED RESIDENCE ON LARGE SITE IN POPULAR AND WELL MAINTAINED ESTATE IN ATHENRY The property is located within walking distance of Athenry town on the Monivea road in this well maintained residential estate. Athenry is a very convenient and popular residential destination being so close to Galway city and within an easy commuting distance of about 15 miles. The town has excellent access to the M6 Galway-Dublin route and with the recently opened M17/M18 Galway-Limerick / Tuam-Gort route with an intersection outside the town. 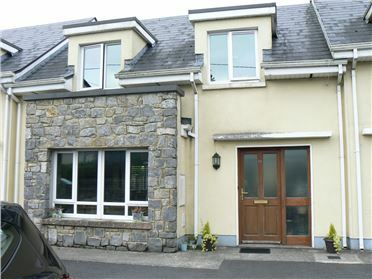 The property is also within walking distance of Athenry train station. The town avails of a vast array of local residential amenities and facilities including excellent National and Secondary Schools, local retail and commercial outlets, Hotels, pubs and restaurants. Athenry\'s Shopping Centre is situated on the outskirts of the town. DESCRIPTION: The property comprises a lovely 3 bedroom semi-detached residence on a spacious site with wide side garden. The property has oil fired central heating and PVC double glazed windows, quality tiling and excellent bathroom and en-suite areas. Excellent stained timber floors upstairs, tiled kitchen / dining area. The property has bright spacious rooms throughout with a fine sitting room with feature fireplace, kitchen / dining area with double doors linking to sitting room and patio doors to rear patio and enclosed garden area. FOR SALE BY PRIVATE TREATY BEAUTIFUL 4 BEDROOM DORMER RESIDENCE IN SUPERB CONDITION AND OOZING CHARM AND CHARACTER WITH A CONTEMPORARY AND WELL LAID OUT DESIGN The property is located close to the local national school and Church at Newcastle situated approximately 4 miles from Athenry town and approximately 3 miles from Monivea village. Newcastle village is a small village with local school, church, community centre and playing field located in a rural yet highly convenient country location within a few minutes from the popular Medieval town of Athenry with excellent motorway and rail links to Galway, Dublin and beyond. All local residential amenities and facilities are available in the nearby town of Athenry and Monivea village and indeed Galway city which is approximately 18 miles from the property. This elegant and stunning spacious 4 bedroom contemporary residence comes to the market in pristine order and boasting a stylish and bright modern family home being one of the finest houses to come on the local market in recent times. Built in 2005 the house extends to approximately 2,000 sq ft and is presented in superb order and in ready to walk into condition. The property boasts an elegant finish with excellent living and reception rooms ideal for modern family living together with 4 fine bedrooms one of which is downstairs beside the main bathroom suite. Two of the upstairs bedrooms are en-suite and the house has a fine bright spacious entrance hallway with feature staircase. There are two main reception rooms, one a very cosy living room with tiered steps and good ceiling height and with a solid floor finish with a beautiful fireplace and feature stove. This sitting room is linked to the kitchen / dining area via lovely French doors allowing excellent circulation and flow to this quality family home. The kitchen / dining area is very attractive indeed with a stylish breakfast counter area, fully integrated units, tiled floor together with patio doors leading out to spacious rear garden. 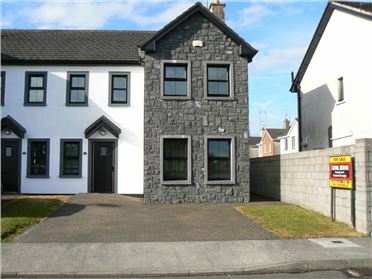 FOR SALE BY PRIVATE TREATY FABULOUS 4 BEDROOM SEMI DETACHED HOUSE IN SUPERB ORDER AND OF GENEROUS PROPORTIONS SITUATED IN A SOUGHT AFTER MODERN ESTATE ON THE EDGE OF ATHENRY TOWN LOCATION: The property is located within approximately 0.8 miles of Athenry town centre. Athenry is a very convenient and popular residential destination being so close to Galway city and within an easy commuting distance of about 15 miles. The town has excellent access to the M6 Galway-Dublin route and with the recently opened M17/M18 Galway-Limerick / Tuam-Gort route with an intersection outside the town. 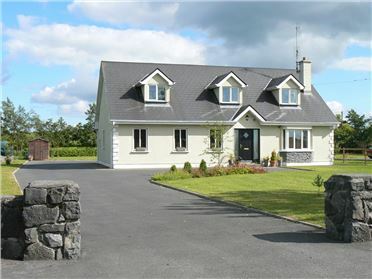 The property is also within walking distance of Athenry train station. The town avails of a vast array of local residential amenities and facilities including excellent National and Secondary Schools, local retail and commercial outlets, Hotels, pubs and restaurants. Athenry\'s Shopping Centre is situated on the outskirts of the town. DESCRIPTION: Beautiful 4 bedroom semi detached house in well established residential estate on edge of Athenry town and in excellent order. The property extends to approximately 1,320 sq ft and is a very spacious modern family home incorporating a lovely bright and well laid out design in this well established and sought after modern estate. 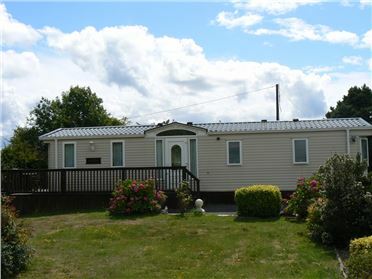 The property has oil fired central heating and PVC double glazed windows. There is an alarm fitted. There is a generous sized front parking forecourt together with spacious rear enclosed garden area. All in all an excellent opportunity to acquire a spacious family home on the outskirts of Athenry town and in such close proximity to all modern conveniences and facilities that the Medieval and Heritage town has to offer.